An Introduction to Special History Reports - by Drew Bennett – WELCOME TO OUR INTERNATIONAL SUPPORT! 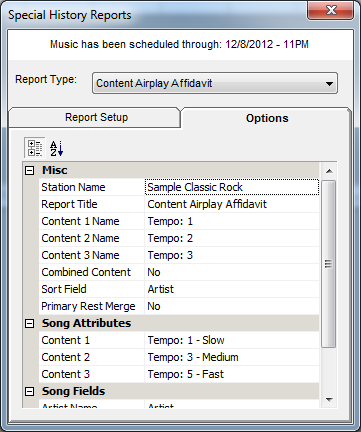 MusicMaster works closely with various organizations that require special reports to be generated from a music scheduler. Special History reports is the section of MusicMaster dedicated to generating specific reports for organizations around the world. You will find this section of MusicMaster by choosing Dataset, Analysis, Special History Reports. MusicMaster has already done the heavy lifting for you. We have consulted with all of these organizations to determine how they would like their specific report formatted. All you need to do is set up a few options, run the report and you are done. You will never have to worry that the report you submit will be incorrectly formatted. Each Special History Report contains two tabs: The Report Setup tab and the Options tab. 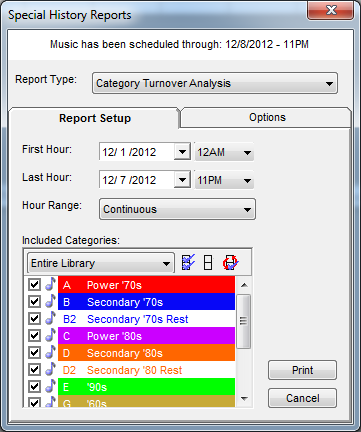 The Report Setup tab allows you to set the dates and times that the report should reflect. It also allows you to choose the categories that will become a part of the report. 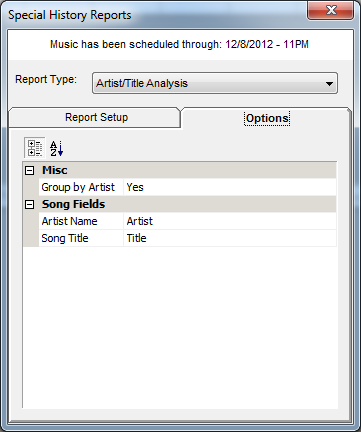 The Options tab will be used to assign the proper fields in your MusicMaster data to the report structure and to set various other options depending on the report. When you view the Options tab for the report you are running, you will see two columns: The left column shows the field names assigned by various organizations. The right column is a pull down menu used to choose the appropriate field from your data. As an example, let’s say the text in the left column says, “Artist.” If you place your artist names in a field called, “Artist,” in your database, you would use the dropdown menu in the right column to choose the Artist field. You would have matched the organization’s field label with the appropriate field in your MusicMaster database. Once you do this you will not need to come here and make these changes again. MusicMaster remembers these settings and you will only need to pull up the proper report, set your dates and time and print the report to a file. We receive several support calls regarding blank reports being generated when a report is run. If this happens to you, double check that the fields in the Options tab have been filled in and nothing is blank. This is typically the issue with blank reports and populating these fields will generally result in a populated report. MusicMaster offers seven general Special History Reports at the top of the pull down menu in the Special History Reports section. These are not vendor or organization specific and they can be useful in generating quick reports to give to consultants, sales staffs, record labels or to review on your own. They are Artist/Title Analysis, Category Turnover Analysis, Composer Credit Affidavit, Content Airplay Affidavit, Generic Log Report, Generic Spins Report and Hourly Summary Report. Artist/Title Analysis – This report shows the plays of each song for the time frame you choose. In the Options tab you can group all songs by artist so that all songs and play times are displayed together under the artist name. If you specify an Artist Keyword field as your artist field, songs will show up under each artist that was entered into the Keyword field. Category Turnover Analysis – This report shows how categories turn over within your database. You will see similar information in the Analysis section of MusicMaster. 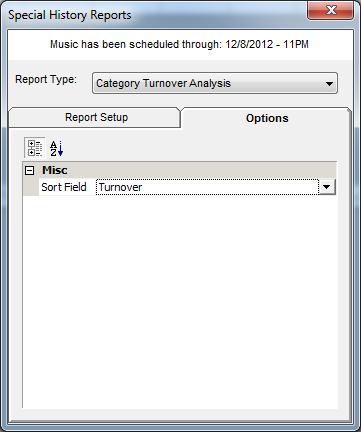 This report can be sorted by Spins, Turnover or Categories. Sorting is defined in the Options tab here. 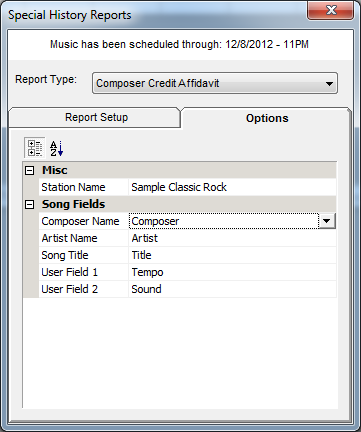 Composer Credit Affidavit – This report shows when a certain composer played during the time frame you choose. You will see the Airtime when the composer played, the composer name, the artist name, title and up to three extra fields of your choosing. Content Airplay Affidavit – This report accommodates up to three user-selected attributes for the affidavit. Usage can be displayed by count or time for the selected time frame. Generic Log Report and The Generic Spins Report - These two reports share a very similar setup. In the Options tab, a user can choose whether to display the report in the default style or display up to ten fields separated by a delimiter. Generic Log Report - This report prints a generic log for the time frame given. Airtime is included by default. This report could be used to generate a quick log for a voice tracker who requires certain fields in view. It might also be parsed and used with HTML to display a playlist on the web. 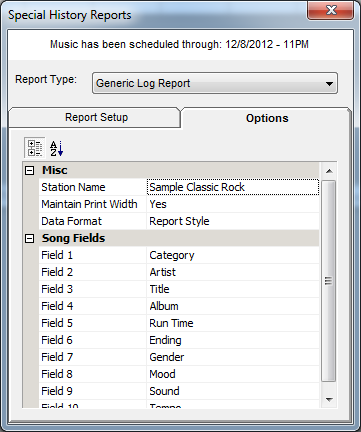 Here is an example of what this report looks like when it is generated using the report style option and displaying ten user defined fields. Generic Spins Report – This report includes the total spins a song got in the time frame given. This report can be used to provide spin information to anyone from a consultant to a sales staff or record label. 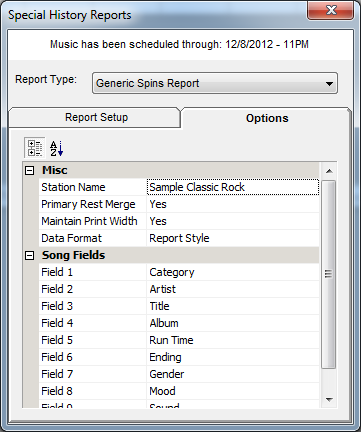 Here is an example of what this report looks like when it is generated using the report style option and displaying ten user defined fields. 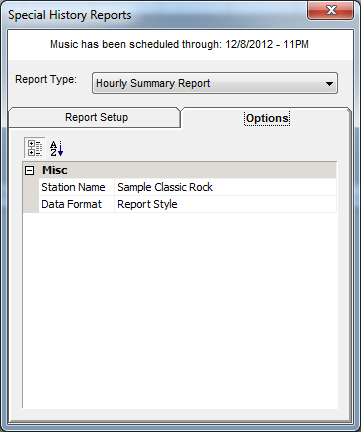 Hour Summary Report – This report includes the date and hour along with total elements, a breakdown of music elements and non- music elements as well as the total runtime of each. The Options tab can be configured to show the default report style or a delimited report. Special History Reports is an important section of MusicMaster as it contains vendor and organization specific reports necessary to report to these various organizations. Special History Reports also contains very useful generic reports that could become a part of your scheduling day. Happy Scheduling!